Award-winning author Kathleen H. Wheeler writes stories that sing because she cannot. A graduate of the University of Illinois, she has wordsmithed as a marketing communications professional for ad agencies and corporations since Nike first coined the slogan “Just Do It.” Wheeler is a music enthusiast and lifelong fan of a British musician known by a one-syllable nickname. Along with her husband and two children, she calls the Land of Lincoln home. Learn more and subscribe for news at BroughtToOurSenses.com. Brought To Our Senses by Kathleen H Wheeler is a poignantly depicted fiction novel about the agony and trials of a family as they witness the decline of their mother as she ages. Jessica, Teri, and Elizabeth have begun noticing that their mother, Janice, is starting to exhibit uncharacteristic and bizarre behavior. Janice has started forgetting appointments, has no interest in her favorite daughter's newborn baby, and is remembering events that had never occurred. The sisters are alarmed, but their older brother, Tom, who lives over a thousand miles away, isn't too concerned. In his mind, his mother is depressed from the death of her close friend and boss of over twenty years, and ultimately the loss of her job. Plus, she is just getting older. The siblings have always clashed and have never experienced peaceful relationships, but when their mother's extreme conduct leaves her lost and confused in a police station many miles away, they unite. Despite their turbulent and less than satisfactory history, they must pull together and find a way to help their belligerent and wayward parent. This is their journey. 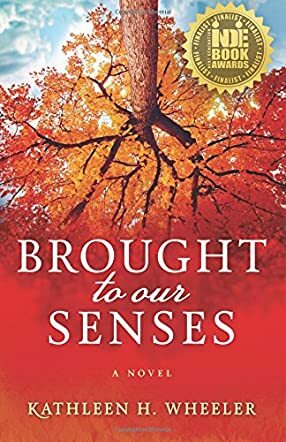 Brought To Our Senses by Kathleen H Wheeler is a heartrending women's fiction novel that portrays the tragic effects of Alzheimer's disease. The story displays an eye-opening and frighteningly realistic account of the chaos and grief that accompany this dreaded malady. I love that Janice's history is woven throughout the book, allowing the reader to know and understand each of the characters, lending insight into the family's incivility and bickering. Janice's journey through life, from her birth until her death, is the underlying mold that forms the story. Although the degenerative disease is the core of the book, it is a moving story about strength and determination in the face of adversity. I admired the way the author presented such a painful subject and applaud her ability to make it authentic. I recommend it to those who love an inspiring women's fiction novel with the stark element of reality. Thanks so much to Readers' Favorite and Susan Sewell for this wonderful review. I'm pleased to know you enjoy and recommend the book.